Are you a glass empty or glass full kind of person? I guess the better question is: as a football supporter do you like to look on the bright side or are you deeply planted in the everlasting world of pessimism? Are you ready for the litmus test? When Rangers get their shots on target they have the best scoring rate in the Scottish Premiership & it’s not really all that close. Rangers have scored off of 58% of their shots on target, the next best team is St. Johnstone at 50%. Celtic? 35%. Now some fuel to feed your pessimist fire. Only 27% of Rangers shots have actually been on target this season….which is the worst rate in the league & again, it’s not really all that close. The next worse team is Motherwell who put 36% of their shots on target. How about a team like Aberdeen, who will be Rangers biggest competition for second place this season? The Dons put 46% of their shots on target. OK…no more gifs for the rest of this post. I promise. The good news is that Rangers still rank third in the league when it comes to non-penalty goals scored. So their scintillating finishing has compensated for their woeful accuracy. Weird, right? When looking at team goal scoring, the following categories are among the biggest factors in assessing why teams are scoring at the rates that they are. The concept of establishing these Four Factors is inspired by the work done covering the MLS by Lowe Down Sports, which roots much of its analysis to Three Factors. This straight forward concept is inspired by statistical analysis done covering basketball. 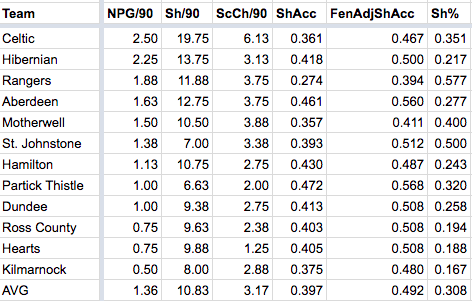 Teams are ranked by Non-penalty goals per 90 minutes, shots per 90, Scoring Chances per 90, Shot Accuracy (rate of shots that are on target), Fenwick Adjusted Shot Accuracy (the amount of unblocked shots that are on target), & Shooting Percentage (rate of shots on target that are goals). Before looking at the actual data, you can see that shot volume is the stats that most aligns with the top five teams in goal scoring. Neither Celtic, Rangers, or Motherwell are very accurate when shooting but it appears that the sheer number of shots is helping them get an edge in actual goal scoring. Hibs is interesting because their finishing is quite poor (9th in Sh%) but they still are second only to Celtic in Non-Penalty goals per 90. 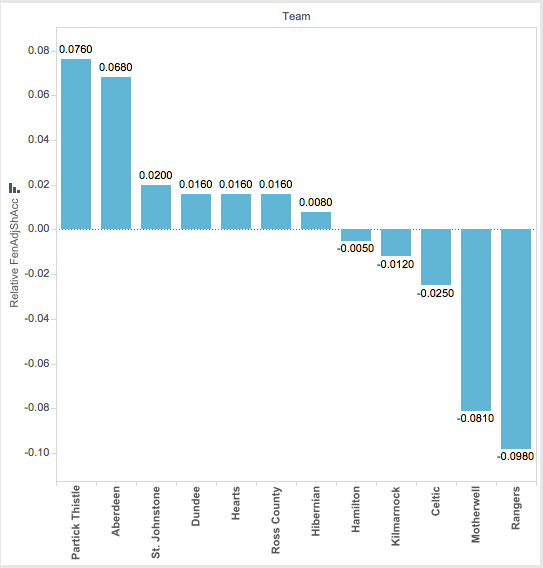 Notice a real divide in actual goals occurs with teams that manage to get 3.00 or more Scoring Chances per 90. The top six teams in goals all average above this rate & there is a 0.25 per 90 difference in goals between the #6 & #7 teams. Keep in mind that the top six teams here are also the top six in the league table (just in a different order). 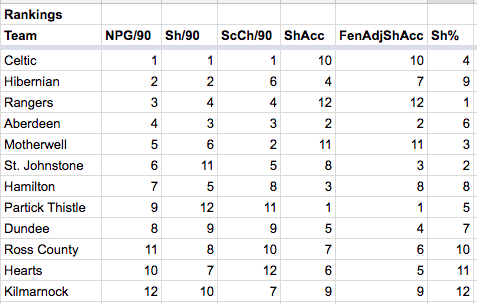 Below you’ll find each team’s non-penalty goals in relation to their Scoring Chances per 90. I have no idea what to make of Rangers rankings…it’s highly unlikely that they will sustain a high Shooting Percentage once they get more shots on target. The fact that 60% of Rangers goals have come from lower percentage shots should be a concern. These are lower percentage shots for a reason. For example, Rangers have scored two goals from just outside the penalty box (Low Danger Shots), only Celtic has more & they have three. Celtic has scored on 7% of these kinds of shots & Rangers have scored on 10% of them. Rangers rate isn’t likely to be sustainable. In fact, only 19% of their shots have been on target, compared to 39% of Celtic’s. Celtic does a better job of getting these shots on target & it is not a stretch to think they can sustain their 7% scoring rate, Rangers on the other hand, with their low shot accuracy, are much less likely to sustain that high scoring rate. At this point let’s look at each of these categories in relation to the league average. For example, below you’ll find how each team’s Non-Penalty Goals per 90 compares to the league average of 1.36 goals per 90. Rangers score 1.88 non-penalty goals per 90, which is 0.52 better than the league average. 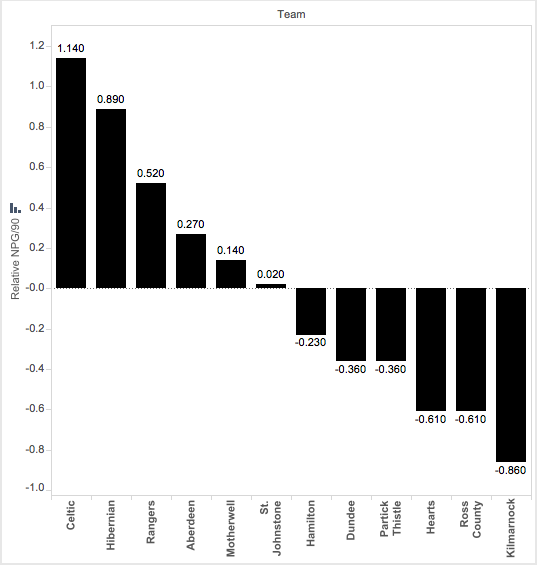 The outliers here are clearly Celtic, Hibs & to a lesser extend Rangers on the plus side. While on the negative side of things we see Kilmarnock, Ross County & Hearts truly struggling to score goals anywhere close to the league average. It’s no coincidence that managers of two of these teams were sacked in recent weeks. We’ll keep these teams in mind while examining the Four Factors that lead to sustainable goal scoring. First, we’ll look at shot volume. The average shots per 90 is 10.83. Celtic’s dominance is just absurd & even though only 31% of their shots are Scoring Chances (5th highest rate), their insanely high shot volume means that they create nearly twice as many Scoring Chances per 90 then the league average. Rangers are ‘only’ getting one more shot per game then the league average. If their scoring rate dips as their Shooting Percentage gets more normalized, they are going to have to increase the amount of shots they get per match to balance that out. Teams are always looking to generate more shots, but it will be critical to Rangers success moving forward given how inflated their Shooting Percentage has been in relation to their Shot Accuracy. At the same time, Partick Thistle scores at a slightly lower rate then average but truly struggle to generate shots. Their Shot Accuracy is the best in the league, despite being 11th in the league in Scoring Chances per 90. They are among the best in the league in getting long range shots on target, but it would be shortsighted to think that this would be sustainable. If their shot generation continues to be low, it’s likely that they may see a dip in their already tepid goal scoring rates. Side note, check out the trend for teams that rely on outside shots at high rates. 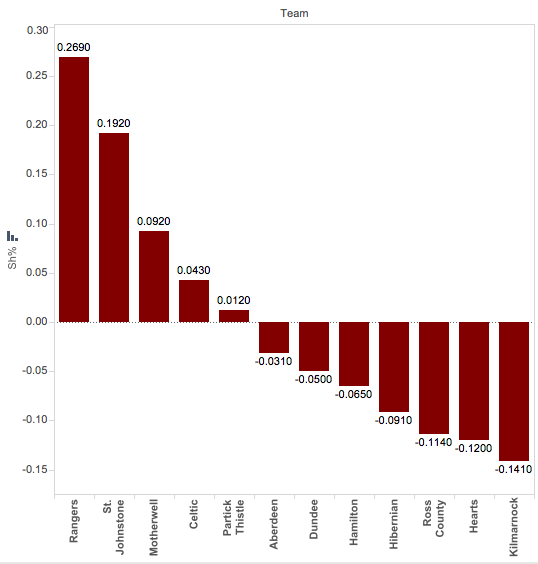 The five teams who rely on shots outside the box the most are all in the bottom six of the standing. Coincidence? 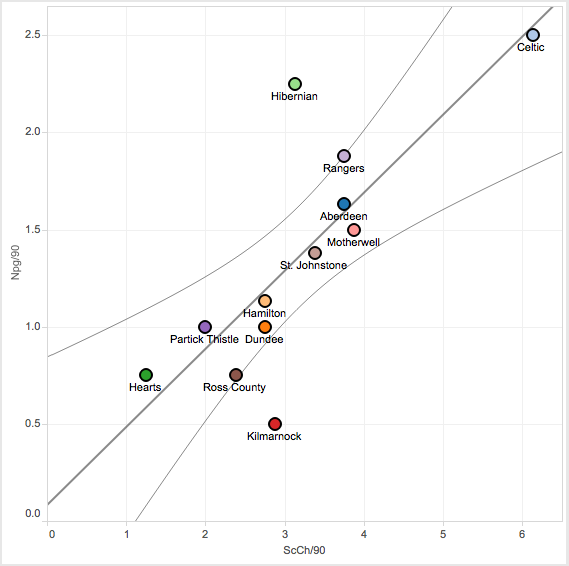 Above you’ll see each team’s Scoring Chances per 90 relative to the league average of 3.17. Again, the bottom six teams are on the wrong side of the spectrum here. Observers who are waiting for Hearts to return to the form that was expected of them…..should probably get used to being let down. 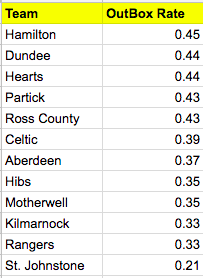 No team has struggled to generate quality chances like Hearts, who only have ten(!) Scoring Chances this season (Celtic has 47). 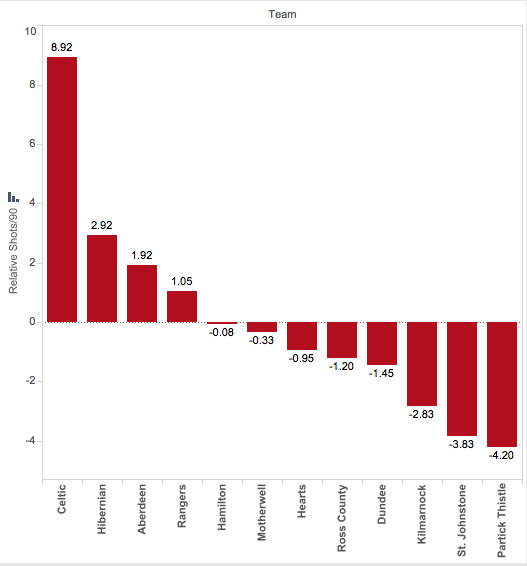 Rangers & Aberdeen are equal in their ability to create quality chances this year, but look at Motherwell. They are only one point behind Rangers in the table & even though we are focusing on offense here – they are actually tied with Rangers in Scoring Chances allowed. If these trends continue…Rangers will be looking up in the table to a team that many predicted would be in the bottom six. But then again….Motherwell are having some of the same issues that Rangers are having. When you hone in on Fenwick Adjusted Shot Accuracy (the rate of unblocked shots that test the keeper) both teams are extreme outliers on the wrong end. You can see that both are woefully below the league average rate of 0.492. Nearly 50% of unblocked shots are on target, unless you are Rangers or Motherwell. Only 39% of Rangers unblocked shots & 41% of Motherwell’s test the keeper. At the same time, both are riding high Shooting Percentages & the concern for both teams (as I’ve mentioned before) is that as their accuracy gets closer to league average…so will their ability to finish. 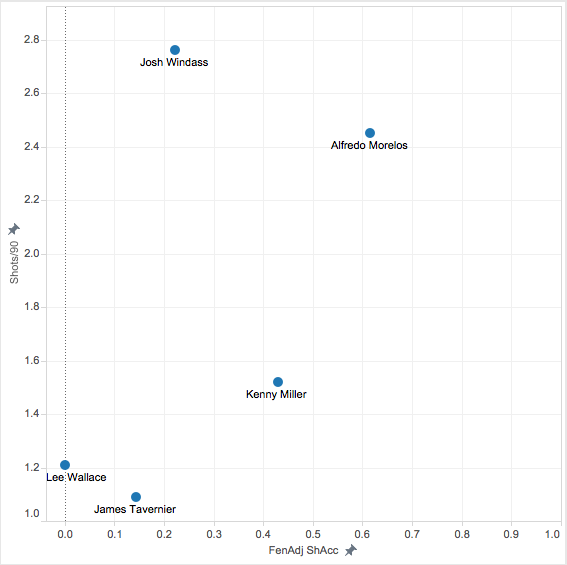 So…which players are dragging down Rangers ability to hit the target. 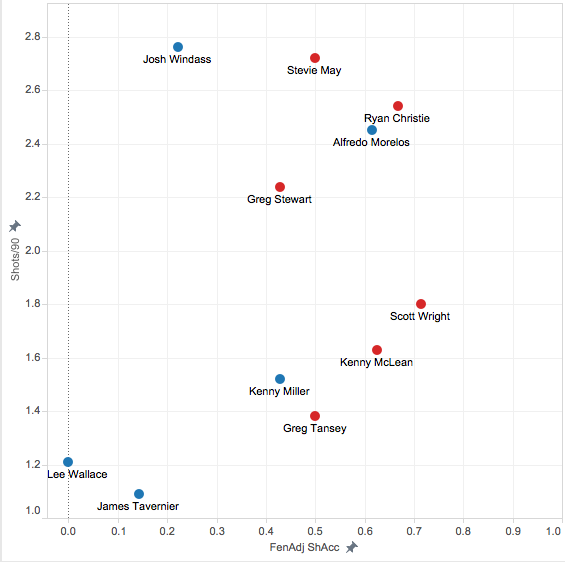 Below, you’ll see each Rangers player who has played at least half the team’s minutes this season & average at least one shot per 90 minutes. That criteria comes down to five players. Two full backs, Josh Windass & Rangers forwards of Christmas past & present. I have been a real supporter of Windass’ inclusion in the lineup given his impact on the build-up to shots….when he is at the end of that build up – well…. 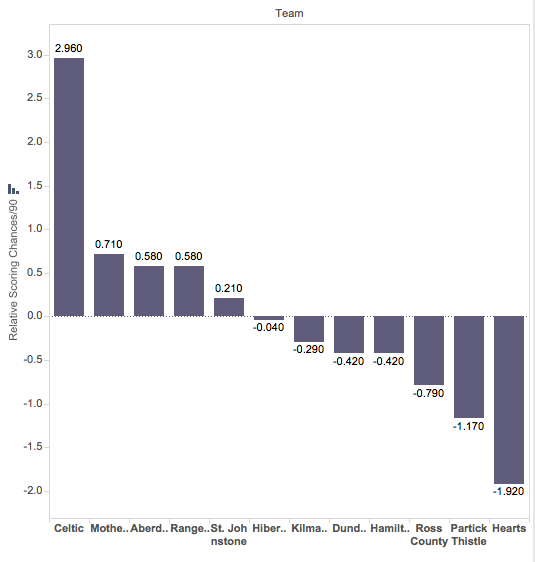 I’m tempted to throw some blame on Rangers’ reliance on their full backs to put shots on goal, but I think we need to see how Rangers compare to their biggest rivals for second place – Aberdeen. The Dons, who sit six points ahead of Rangers, rank second in Shot Accuracy – so let’s see how (& who) are driving their rates. The reality isn’t pretty. Aberdeen have six players averaging a shot or better in at least 350 minutes & only one of them fail to force the keeper into a save 50% of the time. Rangers have one less player averaging a shot or better a game & only one of them actually test the keeper more often than not. Basically, the team lives & dies on the abilities of Alfredo Morelos. What is just as concerning is the fact that you can basically subtract two of the aforementioned players: Lee Wallace (injured) & Kenny Miller (old & learning Snapchat with the U20s). Declan John: 1.61 shots per 90 & 100% are on target…¡viva los full back! No clear cut choice as a second striker. Tangible data suggesting that supporters need to look beyond the price tag & give Carlos Pena more time to prove his worth. Actual competition for who will be Rangers starting left back in 2018. Lastly, let’s look at teams’ Shooting Percentage relative to the league average of 0.308. This simply will not last for Rangers. At this point, the manager may have to make decisions that go against the common conclusions made by supporters about certain players (Pena, Kranjcar, [dare I say] Miller) & see what they can do to lessen the impact of when regression hits. Or maybe it’s time to give other players we have not seen yet a chance? Or maybe a tactical overhaul is the solution? Either way, most of what I have presented to you in this post suggests Rangers are going to see a regression offensively…which is something they cannot afford when one point separates them from their current spot in the table….and sixth place.